Blog Blabber, RenAi Blogger icons and more! I find this week very weird since the only things I’ve watched besides from the ones I blog were Macross Frontier , Xam’d , and Allison to Lillia . I think I’ll drop World Destruction on blogging if it still doesn’t impress me to lighten up my heavy anime load because it would be full as soon as Fall approaches. I also had finished my post for the 5th episode of Natsu no Sora but it came out very short since I found the episode quite frankly boring so I guess I’ll just join that one with the episode 6 post. On other stuff, I know it’s kinda late, but I finaly got Black Diamonds by Nana Mizuki (or Utau of Shugo Chara) and as usual, it was pretty good. I know they look fail since it’s just my first time lols so sorry ^_^”… I personally like the 100×100 ones since they’re all where I put my most effort in especially the AAA recoloured scan. I also had fun putting blood over Mika’s psychotic face XD. If you like then I may make some more next time but now heading off to read the final chapter of Mistress Fortune so toodles until my next post! Last Important Note: Thanks again for those who tuned in to my live Absolute Anime Openings special yesterday and y’all gave me another milestone of 1,034 views! 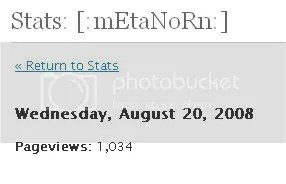 That was the most views that happened on my blog! Thanks again and I made an Absolute Anime Openings page found on this site which lists everything and it will be also updated soon as I add the honorable mention songs there. There are lots of posts coming up on here since I missed a lot. I’ll also try to cover Eve no Jikan and maybe Detroit Metal City. Mamiko Noto copying Rie Kugimiya’s signature “Urusai! Urusai Urusai!” was sooo hilarious! Haruka noticed that Hazuki has been acting very weird and she wonders what is up with her. Mika and Nanami also showed out of nowhere and also agreed to her, they then cooked up a plan to stalk Hazuki as she goes out on her day-off. Nogizaka Haruka no Himitsu ED: Hitosashiyubi Quiet! MOEMOEMOE!!! The ED theme for Nogizaka Haruka no Himitsu is suns by N’s or none other than the über-kawaii seiyuus on the show: namely Mai Goto, Kaori Shimizu, Kana Ueda, Rina Sato and Nogizaka Haruka herself, Mamiko Noto. The ED sequence is a very fun dance number with meidos everywhere. See below for the lyrics. Watching this episode makes me wanna go to The Greenhills/ a.k.a. the otaku haven here in Manila.